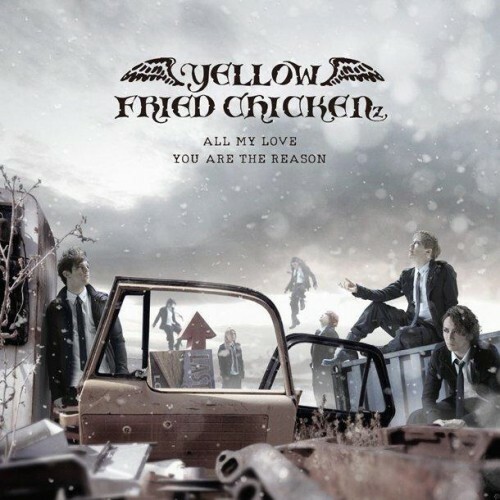 So after convincing myself not to avoid it purely on principle, which is an utterly wrong thing to do, by the way, I looked up the full PV for YELLOW FRIED CHICKENz’s All MY Love, which dropped yesterday. There’s been some good discussions on here lately concerning the internationalization of GACKT, and what’s up with this whole YFCz thing. Well, all those confusing musings and ponderous wonderings aside, may I just state this simple, basic fact of life: regardless of who sings it, how many band-members there are, be it Cascade or Morning Musume nevermind, actually, neither of those acts will ever be cool, when a song is good, it’s good. Get over yourself and enjoy it. Life is too short and your tastes are too rad to waste time being ashamed of your playlist. In any case, all noodling and whining aside, I am actually ok with how All My Love turned out. Aside from the fact that the PV was totally not entertaining or thought-provoking in any way, shape, or form, I basically have no complaints. GACKT loves him some gently falling snow and some military-inspired outfits, wish they had shown more Chacha since I miss that flaming goddess, and I highly recommend Jon invest some time into learning his own stage moves instead of just copying GACKT’s moves like some creepy puppet, but well, you can’t exactly use pet-peeves as the basis for criticism can you? I just did. I’ll even go so far as to (wait for it) state that I was actually impressed by (yeah you can’t believe I’m saying it either) Jon’s performance. While I still consider him completely and entirely superfluous, I actually really enjoyed the harmonies, give him two thumbs up for his Japanese, and thought his voice was nice. The song itself is really decent. The English straddled a thin line between overly repetitive and catchy, but since it’s already stuck in my head we’ll give them the benefit of the doubt. GACKT sounded great, and I thought the orchestral heaves (for lack of a better word) gave the thing a sort of sad-movie-anthem-feel. Nicely done, YFCz, and I am somewhat more hopeful about the whole studio-album thing. On a final note….Maybe it’s just the season, but was I the only one who mentally auto-filled “holy night” into that first line? 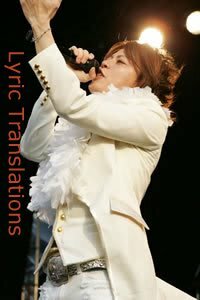 I have an idea, which I may or may not feel like taking down in writing and forwarding to GACKT: Like, maybe he should drop the whole band thing and found the GACKT Orchestra. Then he can have as many band members as he wants on stage and nobody will think anything of it. I like to think of myself as an adaptable soul, and I’m pretty open to change. But I’m also pretty comfortable with the 5-member band formula, now that Visual Kei has pushed me out of the standard 4-man comfort-zone and into the whole almost-as-cool-as-it-sounds “dueling-guitars” thing. But to have 7 band members just hurts my brain. And dear lord, what exactly does that coat on the chair symbolize? Surely not the potential addition of an eighth member? Seriously, this is not A-Peace. And I still can’t figure out for the life of me what Jon’s actual, serious purpose is in this group. I know all the fangirls who harbor tender teenage dreams of going to Japan and starting Visual Kei bands will hate me forever for saying it, but I’m honest-to-gawd just waiting for a logical explanation for his presence in this band. I can’t figure out if GACKT is just working the edge, or trolling us. Not able to scrape enough interest off the bottom of my boot to watch the PV for The End of the Day, after the redundant lyrics pushed me away initially, I will say that I’m not entirely disinterested in All My Love. The song sounds decent enough on its own. That being said, I’m not sure I’m tempted enough to pre-order a copy of YFCz’s new album, destined to drop early 2012. Title is TBA at the moment, but I’m sure it’ll be something relating to the waning phase of a 24-hour segment of time. GACKT will also be releasing a single (solo? As far as I can tell) on the same date (2.22.12), titled Until The Last Day. Still haven’t heard Graffiti, but my Jrock senses tingled as I passed the Christmas tree earlier, and I’m pretty confident it’s in my future, all thanks to myself Santa of course. 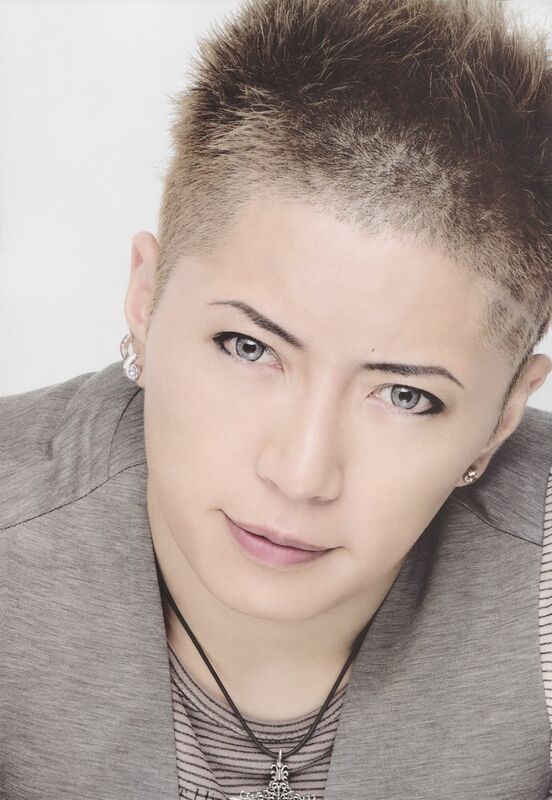 GACKT writes on the walls for 40th single. Although a lot of griping goes down during genre downtime, once we actually get to the other side of the drought– once we can begin to see a glimmer of light at the end of the tunnel, I think there’s something to be said for being denied the very thing we most desire. Think about it, if every single day saw some ground-breaking single or album dropping, not only would you be completely cash-strapped, but you would also be a spoiled, jaded punk. Admit it. Sometimes a little downtime can be good for us. It’s probably great for the artists who aren’t releasing, too. It means that when they finally release something, it has actually been crafted with care, and by the time it finds its way into our hands, our reception is more appreciative. So even though I whined along with the best of you, I find that now that there’s a smattering of awesome releases to look forward to as the cool weather starts waxing, I’m really just, I don’t know, ready for them. After months of lying in a grumpy heap on the floor playing 2008’s singles over and over again, the 4th quarter’s offerings come at the perfect time. I am ready to love them. It would seem that GACKT is stepping it up and showering us with his generous goodwill by keeping a steady stream of releases lined up for the turning of the seasons. Still reeling from the impeccable swag of Episode.0, and still tentatively prodding September’s YFCz first single, we’re now also presented with the news that November 30th will lengthen Christmas lists worldwide with the addition of GACKT’s 40th single, Graffiti. 40 is a nice, round number. And if 40 isn’t an impressive musical-releases benchmark, I just don’t know what is. I remain continuously impressed by GACKT’s ability to sustain his commitment to quality throughout the creation and production of so much music, and I look forward to seeing his career continue on in the future with more excellent and thought-provoking material. Is it just me reading into things too much, or does it seem like perhaps GACKT is making a slight aesthetic switch-up here? Somehow titles such as Episode.0 and Graffiti feel like era-ic titles. It’s different, and I like it. They feel urban and modern, which for some reason comes as a breath of fresh air after a long stream of poetic titles like The End of Silence, Lost Angels, and Flower. Graffiti will be released on November 30th, 2011, in the traditional 2 editions. Limited edition from CDJapan includes bonus DVD, etc, etc, and First Press editions include a poster. The single’s title-TBA B-side will be featured as a character song for the high school-club anime series SKET DANCE. Finally the official preview for one of the Jrock community’s most-anticipated releases, the Hollywood debut of Japanese media’s HRH GACKT: Guy Moshe’s Bunraku. I live in envy of everyone who had the opportunity to see the premier at the INTL film festival in Toronto last year, where GACKT was in kimono’ed attendance. All in all the movie looks pretty sweet. The catch-lines weren’t bad, although it was something of a pointless trailer given that GACKT had no lines. We’ve all seen him in acting roles by now (Moon Child, Furinkazan, etc), but it will be interesting to see him surrounded by whities, acting in a “Hollywood” production, all up in the mainstream and everything. You go, GACKT. Bunraku is destined for release on Sept 1st (VOD), and September 30th (theatrical release). I hope it’s shown nationally. *Synopsis taken from the video info. According to the announcement on GACKT’s official FB as well as the YFCz OHP, GACKT’s grungy side-project is really getting crispy this summer. Not only did GACKT step up his international activities with a considerably more substantial European tour this summer, but he stated another interesting release to put on the list right under Disney x Visual Kei for September: On the 14th, the first-ever official YELLOW FRIED CHICKENz single is destined to drop. It would seem that, for reasons I have yet to fully comprehend, YFCz also buffed up its members by….adding a few? 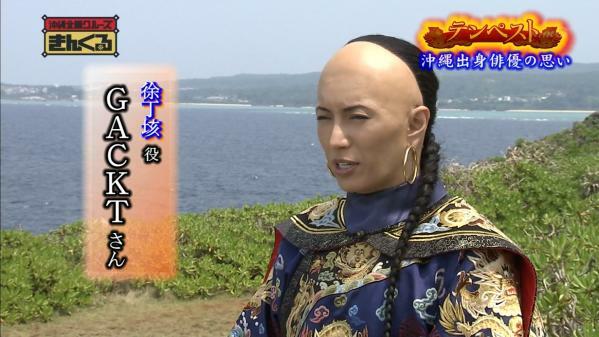 Unfortunately this means saying goodbye to Jun-Ji and Chirolyn, but GACKT’s backup have always seemed relatively temp. Apparently 4 new members have joined ranks: bassist U-ZO (MIYAVI), guitarist TAKUMI (SUGIZO, MIYAVI), drummer SHINYA (Luna Sea), and (WTF moment of the week? Month? Century?) vocalist Jon (formerly of Fade). I realize that was a lot of parentheses. It’s alright to take a breather. This “new format” has been described as “triple guitars and double-vocals”, and is, for a purist and strict GACKT-ian conventionalist such as myself, an absolute and utter blasphemy. I can’t imagine what exactly GACKT plans on doing with this white boy, but as far as I can see, it can’t possibly be Visualist-kosher. And thus, under the weight of this intense suspicion, I will at least (based on my promise to myself to trust GACKT and his decisions enough to not read any books by any covers) try it before I denounce it entirely. That being said, I don’t want anyone to get the wrong idea– absolutely no disrespect is meant to Jon or Fade, or GACKT for that matter, and I respect and admire the “gaijin” who make it in the Japanese music industry… It’s just that GACKT + a second vocalist (especially an English-speaking one) is not a concept that computes. While collabs come and go, this “new lineup” is, in my eyes, one experiment that may have gone beyond my ability to accept. YFCz has also been added to the prolific V-ROCK FEST ’11 lineup. The festival takes place at the Saitama Super Arena in October.